Every evening beginning at dusk, Niagara Falls is transformed into an incredible, multi-coloured water and light masterpiece. Special lights are housed in the Illumination Tower, next to Queen Victoria Place; on the roof of Table Rock Centre, at the brink of the Horseshoe Falls; and deep in the Niagara Gorge, across from the American Falls. Together, these lights work to create a breathtaking view not to be missed. 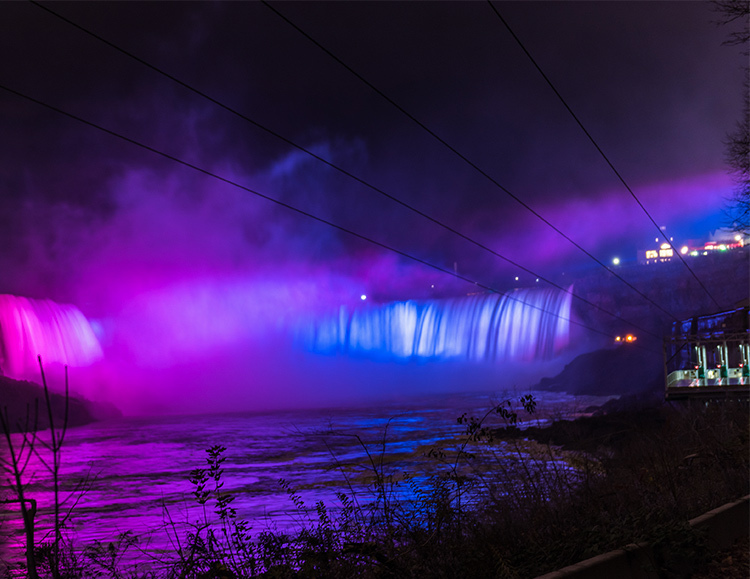 The falls are also lit in custom colours for short durations to mark significant dates in support of charitable causes. Special colour illuminations are provided courtesy of The Niagara Falls Illumination Board. In 2016, almost 20 years since the last major investment in falls lighting, the existing Xenon lights were replaced with new, energy-efficient LED lighting technology. These new lights provide more than twice the previous lighting levels, programmable lighting, and a wider spectrum of colour. The new lights also fill gaps to provide a more consistent lighting effect. The ‘Illumination of the Falls’ has been financed and operated by The Niagara Falls Illumination Board since 1925. The Niagara Falls are often lit in special colours for many registered charities marking a significant date in support of their cause. Special Colour Illuminations are provided courtesy of The Niagara Falls Illumination Board. February 14 - Valentine's Day Pink and red every hour for 15 minutes, illumination extended until 2 a.m.
March 17 - St. Patrick's Day Green every hour for 15 minutes, illumination extended until 2 a.m.
March 30 - Earth Hour Falls will remain dark from 8:30 p.m. to 9:30 p.m.